A foundational concern of Jungian psychology is conscious integration of unconscious psychological content. This objective is so vital to the field that it can be suggested that the Jungian project is principally concerned with the relationship between ego consciousness and the unconscious. In 1921, C. G. Jung published Psychological Types in which he detailed a model that conceptualized consciousness as rooted in an ego-complex that interacts and orients itself using specific attitudes and functions. In this visionary text, Jung developed a hypothesis of personality structure designed to categorize attitudes and behavior patterns in regard to an individual’s inner and outer reality. This theoretical matrix, understood as typology, further advanced the manner in which Jungian psychology understands and approaches the ongoing relationship between conscious and unconscious psychological elements. The Greek Hymn to Hermes, which recounts Hermes’ theft of Apollo’s cattle, mythically personifies two behavioral perspectives useful for conscious integration of unconscious functions: psychic movement as personified by Hermes, and stability as personified by Apollo. The Hermetic and Apollonian behavioral perspectives represent opposing and complementary psychological positions. From a Jungian perspective, tensions and reconciliation between two contrasting perspectives procure a third position, which Jung (1960/1970) aptly called the transcendent function. This third perspective is reached through the creation of a working relationship between innately oppositional elements. The Hymn can be used as a typological guide for building a conscious relationship with unconscious functions, in this case using a specific type code, ENTP, and its associated shadow functions. Myth as a narrative form is well-positioned to facilitate the integration of unconscious functions and illustrate how the tension between the two behavioral perspectives, psychic movement and stability, creates a third possibility: a working relationship. For Jung (1921/1971), the typological objective is to have conscious access to and flexibility with all functions. This requires differentiating the varying functions so they do not remain undeveloped and unconscious. Identifying one’s type usefully distinguishes both the components of an individual’s preferred style of consciousness and orientation towards the inner and outer world. Samuels (1986), discussing the psychic role of unconscious functions, explained that unconscious functions possess “enormous potential for change” (p. 155). He asserted that potential for change can be realized through attempts to integrate unconscious functions. For Jung, integrating unconscious functions has the effect of resolving oppositional dysfunction because in the process of individuation, conflicting typological forces develop new collaborative relationships with each other. As a result, an individual’s conscious attitudes are augmented and enriched by exposure to the opposing attitudes of the unconscious functions. Anthony Storr (1983) regarded compensation and self-regulation as integral parts of typology (p. 18). He warned that if a conscious type preference becomes too one-sided and habitual, then unconscious functions in compensatory relationship might destabilize the conscious standpoint in service to psychic self-regulation. Samuels (1986), further drawing attention to the consequences of unattended unconscious functions, explained: “The excluded function will remain untrained, undeveloped, infantile or archaic, and possibly completely unconscious and not integrated into the ego” (p. 155). Psychological stability requires coming into conscious relationship with unconscious functions. Edward Whitmont (1969), reinforcing Samuels’ statement, argued that “inadequate functions are the doorway through which our difficulties, problems, frustrations, and suffering reach or overtake us” (p. 145), suggesting that our unconscious functions have the potential to either shipwreck the conscious attitude or, if integrated, correct ego one-sidedness. Jung (1921/1971), and later Marie-Louis von Franz (1971), emphasized the powerful and dangerous nature of unconscious functions by attributing shadow qualities to the inferior function. Beebe revised this aspect of the traditional Jungian model by distinguishing four conscious and four unconscious functions. In doing so, he suggested that the functions tend to be accompanied by specific archetypal energies and that the conscious preferences repress the less preferred, or unconscious, functions. As a result, he reasoned that the top four functions should be considered as only half of the overall psychic picture (p. 41). Jung (1921/1971), in a remark that reinforces Beebe’s treatment of shadow functions, wrote: “Each type of thinking senses the other as an encroachment on its own province, and hence a sort of shadow effect is produced, each revealing to the other its least favorable aspect” (¶ 581). This comment valuably supports the manner in which Beebe draws our attention to the necessity of coming into relationship with all four shadow functions. A possible way of coming into conscious relationship with shadow functions is provided by Jung’s treatment of mythology. Jung (1959/1969), discussing the psychological function of myth, explained that myth serves to reveal “the inner unconscious drama of the psyche” (¶ 7). Put another way, myth depicts to consciousness the unconscious and its archetypal forms. Jung argued that we need mythic intermediaries to symbolically courier unconscious content into consciousness. Jung believed that mythic narratives open the conscious standpoint to archetypal propensities, thereby linking inner and outer experience. Mythologist Robert Segal (1998), in his detailed examination of the Jungian handling of myth, explained: “Myth harmonizes the outer world with the inner one, the gods ‘out there’ with the gods within” (p. 94). If myth serves to expose inner and outer psychological life, then it follows that investigating the psychological movements personified in the Hymn is a fitting means to deepen conscious understanding of unconscious type dynamics. The Greek Hymn to Hermes tells of Hermes’ theft of Apollo’s sacred cattle, an evolving conflict, and a final reconciliation that creates a mutually beneficial relationship (Boer, 2001/2006, pp. 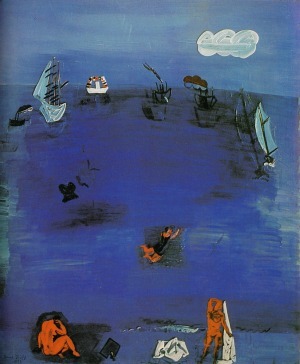 51-56). The character and movements of Apollo can be seen as psychologically representative of the established order, personifying the existent autocratic, hierarchical, and rational position of ego-consciousness. Put another way, Apollo, like the conscious or ego-syntonic functions, represents psychological configurations of judgment, the ego, clarity, stability, supremacy, and control. The Orphic Hymn to Hermes, supporting this parallel, describes Apollo as “the eyes that see all” (Boer, 2001/2006, p. 30). In a sense, the Apollonian is that which reinforces the structures of known reality and is, therefore, mirrored by conscious functions. In the Hymn, Hermes embodies a flux between the old and new. For example, the godling transforms a tortoise into a lyre (Boer, 2001/2006, p. 24). Hermes further personifies psychic movement by traveling: he jumps out of his cradle moments after his birth to voyage a great distance in order to steal Apollo’s cattle (p. 23). 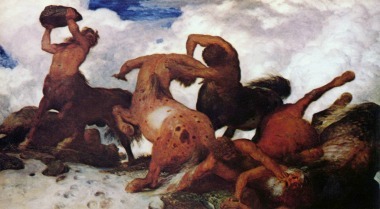 Hermes’ connection to psychic movement is underscored by how he, in an attempt to trick Apollo, reverses the hooves of the stolen cattle. Psychologically, what we see in the movements of Hermes is a personification of an energetic force capable of disturbing the habitual attitude of consciousness by creating new possibilities. In the Hymn, Hermes propagates psychic movement because he wants recognition. For instance, he declares: “As for honors, I’m going to get in on the same ones that are sacred to Apollo” (Boer, 2001/2006, p. 34). In his text Hermes and His Children, Jungian analyst Raphael López-Pedraza (1989) explained that Hermes represents commerce with the unknown borderlines of the psyche (p. 14). Essentially, López-Pedraza indicated that hermetic pathways are ambiguous, multiple, fast, and constantly seeking that which is unnoticed. Expanding this characterization, he suggested that the god’s “main concern is with psychic movement specifically from the literal and known to the symbolic and ambiguous” (p. 11). Here, Hermes is a personification of psychological movement from consciousness to the unconscious. The mythic relationship between Apollo and Hermes personifies a working relationship between two entirely different styles of being in the world. Apollo, lord of reason, light, and order, despite having been robbed and cheated, appears fascinated by Hermes—a figure associated with trickery, liminal spaces, and movement. Apollo describes Hermes’ trickery as “fantastic” (Boer, 2001/2006, p. 37) and later, laughing softly, calls Hermes “friend, trickster, sharpie” (p. 41). We see here the beginnings of a productive relationship between the two brothers. Apollo represents the center of consciousness and Hermes, in contrast, unconscious psychic movement. This distinction is important because, despite the two gods’ intrinsic tensions, they build a lasting relationship. Their relationship reflects Jung’s emphasis on wholeness as the fluid byproduct of the tension between opposites. The siblings seem to come into relationship because Hermes, notwithstanding his barefaced trickery, makes a constant effort to negotiate, seduce, and please Apollo. López-Pedraza (1989), exploring this aspect of the Hymn, wrote that it is as if Zeus “were telling his two sons to get to know each other, to learn more about each other’s nature” (p. 77). Zeus’s words suggest a style of consciousness that seeks a relationship with its unconscious counterpart. The Hymn further demonstrates that Hermes, despite his brazen guile, is not chastised but rewarded with a relationship with Apollo. For example, Hermes, seeking to soothe Apollo, takes out his newly invented lyre, sings for him, and then, at Apollo’s request, gifts his brother the lyre. In doing so, Hermes makes Apollo god of music. After this exchange, Apollo informs Hermes that now, “I think our differences can be settled peaceably” (Boer, 2001/2006, pp. 51-52). At this point in the Hymn, Apollo bestows on Hermes glory among the immortal gods by making him psychopomp, meaning “guide to the underworld,” and promises ever-lasting friendship. Cultivating a working relationship is not about conquering or deception but about intentional acceptance of differences. In regard to typology, if we want to consciously integrate opposing functions, the emphasis should be on accepting differences and aiming for fluidity, not control over the functions. 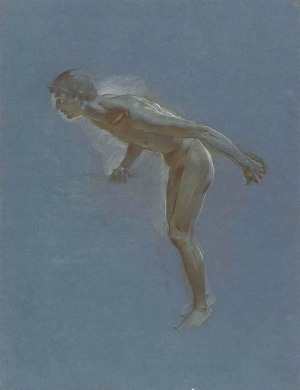 John Hopcke (1989), discussing a common Jungian interpretation of Hermes, suggested that Hermes personifies transformation and change (p. 121). The hermetic emphasis on transfiguration is characterized by disruptive energy that serves to develop new perspectives. As a source of psychic movement, hermetic qualities reflect Jung’s hypothesis of the compensatory function of the unconscious, since Hermes represents the movement from one style of consciousness to another. Jung (1959/1969), for example, argued that Hermes is the archetype of the unconscious because he initiates the conscious ego perspective into the unconscious. For Jung, psychological initiation defines the process by which psychic energy is diverted from one acquired habit into novel and unaccustomed activity (Samuels, 1986, p. 82). All initiatory activity involves the death of one form of being and birth of a renewed and often more desirable condition. Initiation is a potent image of psychological transformation because it focuses on the movement from one style of consciousness to another. Psychic movement creates opportunity for integration of new behavioral perspectives. While conscious integration of unconscious functions may be an intellectual concept, it does not follow that it must be abstract. Integration derives from the Latin integratus, meaning “to make whole” (Chantrell, 2002). Integration is concerned with the process of making whole or replacing fragmented or incomplete parts with a unified whole. As a psychological practice, this can take a plethora of forms ranging from acceptance to merely noticing automatic responses. For example, the inferior function for ENTP, introverted sensation (Si), can cause an individual to make decisions based upon past memories and could prompt a host of complications. Samuels (1986), discussing the importance of consciously experiencing and integrating unconscious functions, explained that making conscious a previously unconscious function is a prime element in individuation because it causes a “rounding out of the personality” (p. 154). Hermetic psychic movement is about creating flexibility between opposing psychological conditions. It is this capacity for dexterity that triggers the necessary movement to transition from one behavioral perspective to another. The two functions most commonly working together in an ENTP are the dominant function of extraverted intuition (Ne) and the auxiliary function of introverted thinking (Ti). In Personality Types, Daryl Sharp (1987) summarized the extraverted intuitive (Ne) type: “Extraverted intuition strives to apprehend the widest range of possibilities inherent in the objective situation” (p. 59). Essentially, dominant Ne types such as ENTP tend to prefer ideas and potential and often neglect the mundane details of life. McAlpine, Shumate, Evers, & Hughey (2009) explained that people with Ne preferences often shift plans, directions; continuously make remote associations; and, in a negative and inflated state, present as fast-paced and overwhelming. The ENTP tendency to rely on intuition often makes them skilled at quick assessments and adaptation. A predominant characteristic is the capacity to see and create seemingly endless possibilities, all glossed with addictive, exciting, and enthusiastic affect. A typical ENTP tends to be less interested in action, follow through, and concrete reality, instead, preferring to generate ideas and possibilities. However, Isabel Myers clarified Jung’s implicit proposal that the psyche needs both a rational and an irrational function ​for balance. Balancing the ENTP’s dominant perceiving, or irrational, function of Ne is the rational judging function of introverted thinking (Ti) held in the auxiliary position. Introverted thinking types have an inclination for precise language, efficiency, and making decisions “oriented primarily by the subjective factor” (Sharp, 1987, p. 70). People with this preference report enjoying problem solving, unpacking the mechanisms of how things function, and being skilled at complex analysis. We are frequently pairing perceiving and judging functions in the same attitude, … a combination not normally mentioned in the functional pairs or function-couplings literature. The initial analysis is also indicating that we may have use of all of the function-attitude couplings to some extent, regardless of where the function-attitudes reside in our type dynamics framework. In exploring movement between contrasting functions, the difference between how introverted intuition (Ni) and introverted thinking (Ti) preferences influence adaptation lends a useful example. The first shadow function for ENTP, introverted intuition perceives grand patterns, themes, and systems designed to identify meaning and significance. For Ni, emphasis is placed on understanding through abstraction and essentialism. While both Ni and Ti show a proclivity for large systems and patterns, introverted intuition affects how one relates to one’s experience via unconscious perceptions whereas introverted thinking is focused on an inner rational locus of control. People with Ti preferences develop complex systems to explain how things work. New information is categorized within constantly reevaluated internal matrices. Essentially, each of these functions demonstrates a contrasting model of behavior, one emphasizing macro patterns and unknown sources of knowledge and the latter comprehensive and precise inner categories. If an Ni shadow function is unconscious and engaged in a process of integration, it quite possibly could negatively impact the organizational system of the auxiliary Ti. Similar to the Ni and Ti dynamic, there is a stark juxtaposition between extraverted thinking (Te), the second shadow function, and an ENTP’s dominant preference, extraverted intuition. Sharp (1987), describing Te qualities, wrote that this preference tends to be “conditioned by objective data transmitted by sense perceptions” (p. 44). Te types report a preference for establishing order, methods, and clarity. In addition, McAlpine et al. (2009) suggested that Te shadow functions can be overly disciplined. Consequently, the fluid and ever-seeking nature of the Ne could be destabilized by the Te’s focus on order and logic. However, it is also apparent that the Te’s capacity for organization and practical manifestation might act as counterpart to the omni-directionality of the Ne. In other words, Ne types, full of ideas and possibilities, might benefit from the competence in the objective world so intrinsic to the Te. Thus, it becomes possible to reason that an individual’s rigidity around the dominant Ne and auxiliary Ti might, if conscious expression of the Te function were permitted, be mitigated, enabling a wider sphere of effectiveness. We cannot make a case for psychic movement without recognizing the need for stabilization. In integrating unconscious functions, the object is not to annihilate the existing conscious typology but to find a middle ground—a stable, though evolving, conscious position. Treating psychic movement and stability as two opposing forces creates space for the emergence of a third possibility: the working relationship. Jung called this phenomenon the transcendent function—a new modality which can only be attained via engaging opposing functions and yet which “transcends” them. Jung described the transcendent function is the product of a process by which antithesis and thesis encounter each other and organically come into relationship. The notion of transcendence, specifically in theistic contexts, implies the capacity to rise above or transcend negative conditions. In regard to type, we can imagine that the conflict between opposing conscious and unconscious functions might spark the emergence of a new psychological system. In Mysterium Coniunctionis, Jung (1963/1970) asserted: “The opposites are the ineradicable and indispensable preconditions of all psychic life” (¶ 206). And so, for Jung, the unconscious is an essential counterpart to consciousness, even though it presents in our daily lives as a distinct psychological realm. Jung believed that even when opposites are integrated into consciousness, they still contain a spectrum of duality, implying that on an archetypal level, psychological life remains polarized. 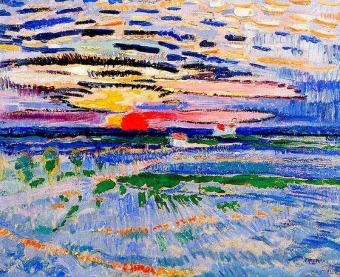 Although Jung made clear the importance of psychic duality, he argued that the goal is to bring consciousness and the unconscious into harmony. Thus, wholeness implies the fluid movement between a pair of opposites. Samuels (1986), summarizing this psychodynamic, explained that Jung maintained that during the collision between opposing forces, the unconscious often creates a third possibility (p. 102). 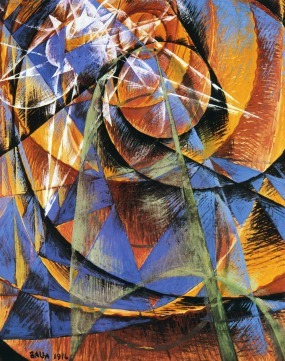 It is the emergence of the third possibility that Jung argued shifts psychic energy. He warned that psychic synthesis is temporary, meaning individuals are always caught in the ebb and flow of opposites. The idea of constant movement between opposites has implications for typology because it implies an individual’s relationship with both conscious and unconscious functions moves along a scale. We can never arrive at compete integration. Instead, the most we can hope for is flexibility, acceptance, and cooperation. Here, the task of integrating functions to achieve a temporary and fluid state of wholeness should not be considered a finite goal but a practice of consciously observing and coming to terms with the psychological movement between oppositional functions. The evolution of Apollo and Hermes’ relationships offers insight into how ego-dystonic functions might approach the established ego-attitude. 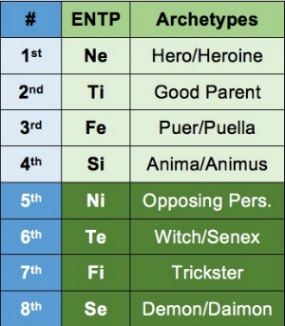 For example, as mentioned above, in the ENTP type matrix, Ni stands in the fifth or opposing personality position according to the Beebe model. Ni types are deliberate in conversations, masters at synthesis, and intimate with the unconscious. In essence, Ni types seek the theoretical nature of all things and their complex interrelationships. Sharp (1987), discussing the negative tone of Ni preferences, warned that the introverted intuitive is often lacking in concrete manifestation. In this type we see a tendency to be “mystical daydreamers” (p. 85). Ni in the fifth position may cause an individual to “second-guess” his insights (McAlpine et al., 2009) while developed introverted thinking thrives on precision and strives to create grid-like systems of categorization that act as frameworks for structuring and guiding analysis (Haas & Hunziker, 2006, p. 84). Here we see the tension between the adversarial energy of Ni-5th, which “may not trust [its own] visions” (McAlpine et al. ), and the auxiliary Ti’s initiative to organize systems in terms of “logical relationships” (pp. 64, 84). It appears that in this tension, the conscious attitude can take two standpoints: either the conscious Ti could be so threatened by the Ni that is banishes it into the unconscious or the auxiliary Ti could seek a relationship with Ni as Apollo does with Hermes. Hermes’ theft of Apollo’s cattle mythically personifies two opposing behavioral perspectives: psychic movement and stability. Through the tension of these two energies there emerges a third possibility, a relationship moving towards wholeness. In the Hymn, the clash between Apollo and Hermes transforms both gods: Apollo is gifted with music, and Hermes is welcomed into the pantheon of immortals. 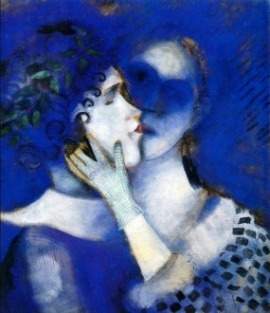 Psychologically, this implies that each needs his counterpart in order to achieve transformation. The process of integrating unconscious functions is best approached by individuals who accept the tension between psychic movement and stability. Perhaps, conscious attention to both of these perspectives can help to create a new relationship with unconscious functions. Beebe, J. (2006). Evolving the eight-function model. Australian Psychological Type Review, 8(1), 39-43. Boer, C. (2001/2006). The Homeric hymns. (C. Boer, Trans.). Hubbardston, MA: Asphodel Press. Chantrell, G. (Ed.). (2002). The Oxford dictionary of word histories. Oxford, UK: Oxford University Press. Haas, L. & Hunziker, M. (2006). Building blocks of personality type: A guide to discovering the hidden secrets of the personality type code. United States. Eltanin Publications. Hopcke, R. (1989). A guided tour of the collected works of C. G. Jung. Boston, MA: Shambhala Publications. Jung, C. G. (1921/1971). Psychological types (CW 6). H. Read, M. Fordham, G. Adler, & W. McGuire (Eds.). (H. G. Baynes & R. F. C. Hull, Trans.) Princeton, NJ: Princeton University Press. 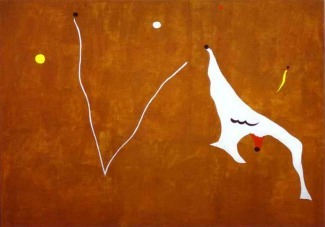 Jung, C. G. (1959/1969). The archetypes and the collective unconscious (CW 9i). H. Read, M. Fordham, G. Adler, & W. McGuire (Eds.). (R. F. C. Hull, Trans.) Princeton, NJ: Princeton University Press. Jung, C. G. (1960/1970). The structure and dynamics of the psyche (CW 8). H. Read, M. Fordham, G. Adler, & W. McGuire (Eds.). (R. F. C. Hull, Trans.) Princeton, NJ: Princeton University Press. Jung, C. G. (1963/1970). Mysterium coniunctionis (CW 14). H. Read, M. Fordham, G. Adler, & W. McGuire (Eds.). (R. F. C. Hull, Trans.) Princeton, NJ: Princeton University Press. 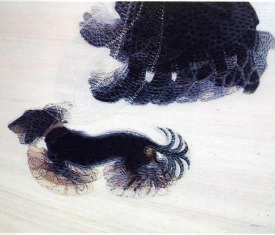 López-Pedraza, R. (1989). Hermes and his children. Einsiedeln, Switzerland: Daimon Verlag. McAlpine, R. & Weed, S. T. (2017, July). Exploring function coupling interactions. Personality Type in Depth. Samuels, A., Shorter, B. & Plaut, F. (1986). A critical dictionary of Jungian analysis. New York, NY: Routledge & Kegan Paul. Segal, R. A. (Ed.). (1998). The function of myth. In Jung on mythology (pp. 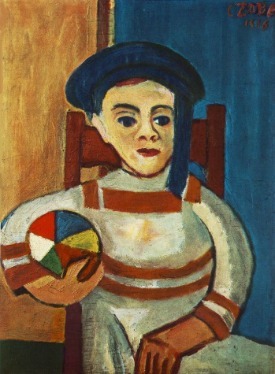 85-100). Princeton, NJ: Princeton University Press. Sharp, D. (1987). Personality types: Jung’s model of typology. Toronto, ON: Inner City Books. Shumate, C. (2008, 2009). The opposing personality: Recognizing the archetypal energy. Bulletin of Psychological Type, 31(4), 47-52 and 32(2), 36-41. Storr, A. (1983). The essential Jung. Princeton, NJ: Princeton University Press. von Franz, M.-L. (1971). The inferior function. In J. Hillman & M-L. von Franz, Lectures on Jung’s typology (pp. 1-54). Irving, TX: Spring Publications. Whitmont, E. (1969). The symbolic quest: Basic concepts of analytical psychology. Princeton, NJ: Princeton University Press. 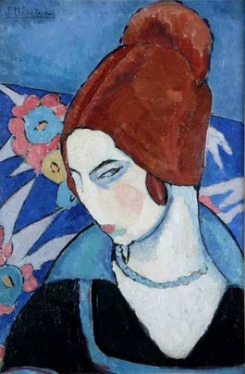 Balla, G. (1912). Dynamism of a dog on a leash. 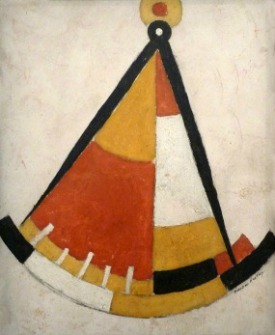 Courtesy: Albright Knox Art Gallery, Buffalo, NY. 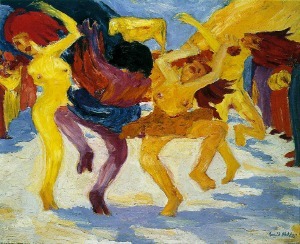 Balla, G. (1914). Planet Mercury Passing in Front of the Sun. Courtesy: Georges Pompidou Center, Paris, France. 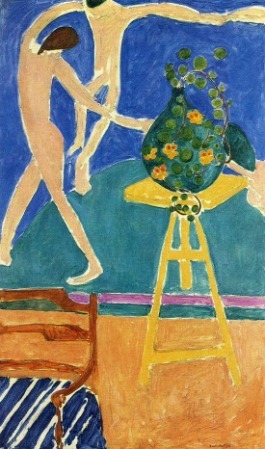 Matisse, H. (1910). 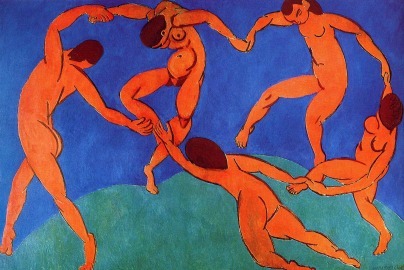 Dance II. Courtesy: Hermitage Museum, Saint Petersburg, Russia. [ENTP] I like the discussion on Ni and Ti. Personally, I find Ni to be a valuable complement to Ti. With Ti, I want to refine ideas down to their most fundamental building blocks. Problem is, that refining process can take a lot of time and energy, and isn’t always worth the effort. With Ni, I’m reminded when these building blocks aren’t as universal as I’m expecting they’ll turn out to be — they’re constructs that are valuable in certain contexts, and not necessarily as useful in others. This insight enables me to hold the building blocks more loosely, and more readily shift perspectives. For me, Ne-Te isn’t as smooth as Ni-Ti, but I do find value there too. For example with Ne, my radar is constantly scanning for better ways to do things. Most of the time this is fun, and with things I’m good at, it can be highly effective. But there are times when this process produces too much tire-spinning and not enough driving. Whereas with Te, I can find it liberating to follow a step-by-step plan to finish an activity, instead of fussing around with possibilities. Again — this doesn’t always work out as smoothly as Ni-Ti, but it is something that I find valuable. Joanna Capelin, MA, is a doctoral student at Pacifica Graduate Institute working on Descent and Ascent: Mythic Styles of Consciousness in Underworld Journeys, which explores Greek mythic underworld descent and ascent motifs and how these underworld journeys might evoke distinct styles of consciousness. 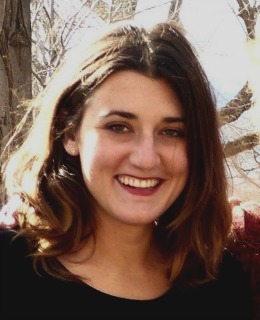 She presented a paper at the 2016 JSSS Earth and Psyche conference, “The Rhizome: Exploring a Jungian Symbol for Psychoid Reality,” and as an undergraduate at Colorado College she presented a paper on “The Ecological Restructuring of Contemporary Society” at the Aspen Environmental Forum.